Alternative Approval Process (AAP) - Bralorne Sewer System Local Service Conversion and Establishment Bylaw No. 585, 1995, Amendment Bylaw No. 1614-2019 (the “Proposed Bylaw”). In 2016, the SLRD was awarded a Gas Tax grant of $1,999,530.00 (the “Grant”) for the new Bralorne sewer system project (the “Project”). The Project comprises 2.3 km of piping, 107 service connections and a new wastewater treatment plant capable of meeting modern standards. The Project is considered critical to the long-term health and sustainability of the Bralorne community. In order to receive the full amount of the Grant, the Project must be completed by December 31, 2019. Otherwise, a claw back of $299,929 is expected to be applied (15% of the Grant = $299,929). To address the shortfall between the Grant funding and the actual cost of the Project, the SLRD has been working to secure additional loan financing. The scope of the Project has been reduced. On February 27, 2019, the SLRD Board authorized a short-term loan (i.e. 5 years) of $300,000 (“the “Loan”) for the purpose of completing the Project. The estimated annual debt servicing costs are $69,000 for a total of 5 years. Please see below for financial impacts. In order to cover the debt servicing associated with the $300,000 loan, the SLRD is in the process of seeking elector approval via Alternative Approval Process (“AAP”) to increase the maximum annual requisition under the Proposed Bylaw. 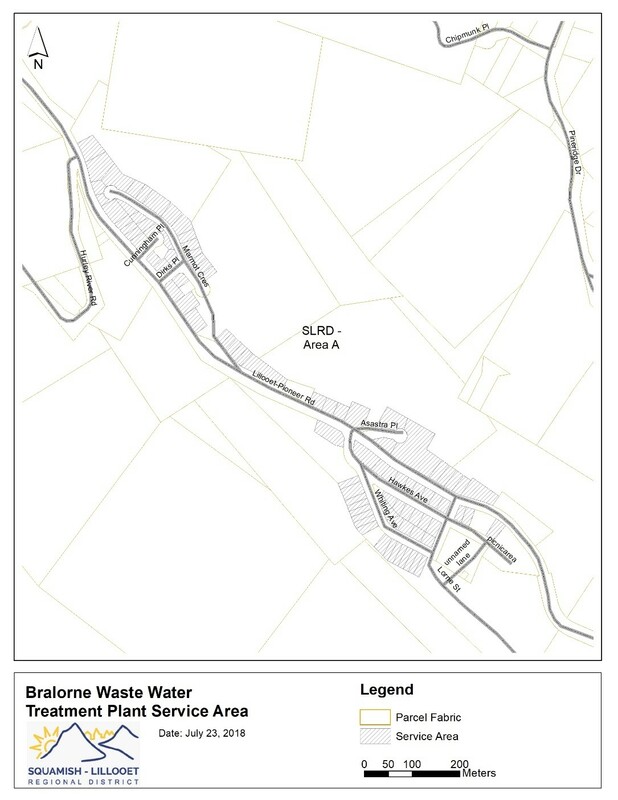 Although the Bralorne sewer system is currently exempt from having to meet current community wastewater standards (such as the requirement to have a secondary treatment component), the exemption is not ensured to remain in place indefinitely - the provincial government has previously advised the SLRD that it could potentially require the secondary treatment via imposing a permit amendment to the existing discharge permit. If the Project is not completed and the provincial government requires a secondary treatment component to be implemented in Bralorne, the SLRD would then explore how loan financing could be secured and the associated tax requisition increase for the debt servicing costs. At a minimum, what would be required is the total of $300,000 (current identified funding shortfall) + $299,929 (portion of Grant expected to be forfeited) + undetermined construction cost escalation. Conditional upon adoption of the Proposed Bylaw, Electoral Area A Director John Courchesne and the SLRD Board have agreed to provide Area A Northern Area BC Hydro Payment in Lieu of Taxes Funds Reserve (“PILT Funds”) to be applied towards reducing the debt servicing costs. The reduced debt servicing costs come to an estimated $543 per parcel (inclusive of the mandatory 5.25% provincial fee), which is on top of the $346 that is the existing maximum requisition amount per parcel per year. The table below shows the total payable per parcel based on the existing maximum requisition amount of $31,250 plus the amount required to service the Loan after applying the PILT Funds of $20,000 for 5 years (i.e. $49,000). After 5 years, as the Loan will be paid off (i.e. no further debt servicing costs), the amount per parcel should revert back close to the previous amount of $346/per year, plus amounts to account for inflation. If 8 or more electors formally oppose the tax requisition increase that is necessary to service the Loan (i.e. by completing and submitting the elector response form referenced in the attached Notice of Alternative Approval Process), then electoral approval will not be obtained, the Proposed Bylaw will not be adopted, and the Project will not be completed due to the existing funding shortfall. This AAP is the last opportunity to access the remaining 15% of the Grant (as it is expected to be forfeited if the Project is not completed by December 31, 2019) and to complete the Project at construction pricing that was secured in 2018. Local governments can use an Alternative Approval Process as a way to obtain electoral approval with respect to certain types of proposed bylaws. An AAP is less expensive than undertaking assent voting (referendum). Learn about the Alternative Approval Process for local government. Prior to undertaking an AAP, the Inspector of Municipalities (Ministry of Housing and Municipal Affairs) must first approve the request. The SLRD received approval from the Inspector of Municipalities on April 4, 2019 to undertake an AAP for the Proposed Bylaw. The Proposed Bylaw will allow the SLRD to tax requisition the additional funds necessary to pay the debt servicing costs associated with a short-term (5 year) loan of $300,000. As additional notice, the SLRD is also publishing the Notice of Alternative Approval Process in the Mountain Telegraph on May 6, 2019. The deadline for submitting elector responses for this AAP is 4:30 p.m. on May 21, 2019. The method by which an eligible elector expresses opposition to the Proposed Bylaw is by signing and submitting an Electoral Response Form to the SLRD (before 4:30 p.m. on May 21, 2019). Eligible electors must provide their full name and residential address. Eligible non-resident property electors must also provide the address of the property that they own within the Bralorne Sewer Service Area and they are only entitled to sign and submit one elector response form, regardless of how many properties they may own within the Bralorne Sewer Service Area. If a property is owned by more than one person, only one of the owners may submit an Elector Response Form in respect of that property and a majority of the property owners must sign a Consent setting out which of the owners is authorized to submit the Elector Response Form on their behalf. If a corporation is the owner (or one of the owners) of the property, no one may submit an Elector Response Form in respect of that property. If 10% of eligible electors in the Bralorne Sewer Service Area - 8 people - oppose the SLRD Board's intention to adopt the Proposed Bylaw, the SLRD Board cannot proceed with adopting the Proposed Bylaw unless elector approval is obtained via assent voting. If the 10% threshold is not attained (i.e. if less than 8 electors submit Elector Response Forms), then the SLRD Board may proceed with adopting the Proposed Bylaw. The SLRD will use this page to provide regular updates on this project. Using the mailing addresses provided by BC Assessment, a letter to property owners in the Bralorne Sewer Service Area was sent out via regular mail on April 9, 2019.